Myanmar, today, is enmeshed in a humanitarian crisis of staggering proportions – the Rohingya Crisis as it’s commonly known. The nature of events has seen Bangladesh now hosting upwards of a million human beings who have moved north across the Naf River border between the two countries seeking refuge and personal security. The international reaction has largely focussed on reports of brutality and maltreatment of the people in Myanmar, but there has been very little public examination of the context of the situation and the way forward. On Thursday 31 May 2018, former Australian diplomat President of the Australia Myanmar Institute Christopher Lamb addressed the Sydney Institute to explain some of the complications and misunderstandings on this issue. It is Chris Lamb’s hope that pubic discussion will now centre around possible ways forward and relate those ways to the interests of the Myanmar Government, the Rakhine populations and the region. What’s new to most Australians in any discussion of Myanmar and the Rohingya crisis is their discovery that there is such a crisis and there are people who identify themselves as Rohingya. Its origins are regional, but in essence it’s become a Burmese word, and it’s been around for a long time in one form or another. To understand for about how long people movement has taken place at crisis levels in that part of the world it’s worth noting that, on 31 December 1784, the King in Amarapura, the capital then of what we came to call Burma, conquered the Arakanese kingdom which had its capital in a place called Mrauk-U in the northern part of what is now the Rakhine state. And that led to the flight north of an estimated one third of the King’s Buddhist subjects. They fled north of the Naf River, a significant body of water reaching the Bay of Bengal between today’s Myanmar and Bangladesh. At that time, it was all part of the same land area. It had various names over time but for the purposes of this discussion it was an area called Ramu, with a population spread almost as far north as the city of Chittagong in modern Bangladesh and as far south as Akyab, now Sittwe the capital of Myanmar’s Rakhine (Arakan) State. In 1784-85 the British ran their India-world through the East India Company, which involved what we would see today as a complicated trading partnership between the Company and local rulers. There were, however, some British colonial (as opposed to company) possessions within the area controlled by the East India Company governed as part of Bengal from the city then known as Calcutta. There were, however, some British colonial (as opposed to company) possessions within the area controlled by the East India Company governed as part of Bengal from the city then known as Calcutta. Cox arrived in the 1890s, looked at the Arakan refugees, and decided that what they needed to sustain themselves and give them dignity in the future was a market. So, he established became known as Cox’s Bazar, in a place where nobody had yet given a name to a township. In all of that world, where the colonial names have given way to local names, names such as Kolkata, Dhaka and Sittwe in Myanmar, one of the few that has survived is Cox’s Bazar.In all of that world, where the colonial names have given way to local names, names such as Kolkata, Dhaka and Sittwe in Myanmar, one of the few that has survived is Cox’s Bazar. Right now Cox’s Bazar and its surroundings are home to perhaps a million people who’ve fled north across the Naf River. Some of them came earlier and there were various flights of people from what is now Myanmar into the area there. You’ve got upwards of half a million people, according to numbers there, who had fled north in the last 50 or 60 years, across the line. The largest refugee camp-complex in the world today, Kutupalong, houses about 550,000 people (many of whom have been there since earlier flights north from Myanmar). The refugee population around Cox’s Bazar has grown and shrunk over the decades. Over that time some have been repatriated, some have gone back of their own accord, some have moved to third countries but very many stayed. It is reasonable to say that by the time the 2017 influx began at the end of August there were as many as 200,000 people still there from previous flights of refugees and displaced persons. There are reasons why they didn’t return: some of them were fearful about what might happen to them, some of them found that it was not too inconvenient to live there with the degree of international support that they had – and that balanced against the issue of freedom. And then, since about October 2016 and conflict in the border areas neighbouring Bangladesh, numbers grew rapidly again. There are reasons why they didn’t return: some of them were fearful about what might happen to them, some of them found that it was not too inconvenient to live there with the degree of international support that they had – and that balanced against the issue of freedom. The biggest acceleration in numbers came in late August 2017 following the issuance to the Myanmar government of a report into the 2016 situation by an advisory commission headed by former UN Secretary General Kofi Annan. The Commission, with three distinguished international participants and six highly respected Myanmar personages. When announcing the creation of the advisory commission, Daw Aung San Suu Kyi noted that the task would cover the situation in the Rakhine State, not limited to the 2016 conflict areas. The Annan Commission issued a preliminary set of recommendations in March 2017 which provided a good insight into the final report’s content. The general response from the government was one of satisfaction with the direction being taken. The final report was presented to the government on 23 August 2017. I was in Myanmar in the days leading up to the presentation of the report and it’s worth noting now that the timing of presentation and the generality of the contents was widely known among interested people. The Annan Commission issued a preliminary set of recommendations in March 2017 which provided a good insight into the final report’s content. The next day press conferences were held and the country learned that the report had been accepted in full and would be implemented as is. Very soon after that, a matter of hours, a grouping which we now know as ARSA – the “Arakanese Rohingya Salvation Army” – launched a coordinated attack on about 30 police posts and border posts in the northern Rakhine State where many of the Rohingya people live. This produced an expected, and from all accounts a gross and disproportionate over-reaction from the Myanmar security forces (Tatmadaw). At this point it’s worth saying that a disproportionate reaction was very predictable. A difference between this over-reaction and those of the past (in Rakhine and elsewhere in Myanmar too) is that this was the first major military event to reach the outside world instantly through wide media coverage and very wide social media participation by people on the ground. It was also news of widespread civilian suffering. This ensured wide mainstream media coverage, often at the expense of analysis of what was happening on all sides of the conflict. News about much more sober matters, like steps towards reconciliation or the future, didn’t get into most media, and less so in Australia than in other countries with well-staffed international arrangements . Australian media companies have virtually no staff located in ASEAN countries anymore and while they get good material from stringers and agencies there’s no strong reporting line with depth in it designed for Australian readers. That’s a particular pity in the case of Myanmar. Myanmar is an important country for us. It’s close to Australia. A large number of people originally from Myanmar have made their homes here. More and more Myanmar students are furthering their education in Australia. It’s a rich country with strong, hard-working people and abundant natural resources. It is strategically important for Australia given its location between India and China. More and more Myanmar students are furthering their education in Australia. This is why it’s important to speak tonight about the context of the Rakhine situation as seen on TV screens today. A first point to make is that, despite what you may have thought after reading some of the press coverage, not all Muslims in Myanmar or in the Rakhine state are “Rohingya”. I don’t intend to describe the history of Muslim migration into what is now Myanmar, but it is a migration that has seen Muslim people come to Burma/Myanmar at different times, for many centuries, responding to different needs including a significant influx derived from slave trading. Many more were brought later, during the British time, filling jobs such as civil servants, accountants, business administrators, auditors, actuaries and so forth. Many more were brought later, during the British time, filling jobs such as civil servants, accountants, business administrators, auditors, actuaries and so forth. In Rakhine there is a small but historically significant population in about three other centres – people called the Kaman – derived from the days of the old Mughal Empire in India and the 1660 flight to safety in Rakhine of a Mughal prince and his followers. This Muslim population is considered indigenous in Myanmar and enjoys all the rights of citizenship. This is one of the many reasons why it is difficult to use a shorthand to describe the Rohingya as “Arakan Muslims”. There is a lot of confusion outside Myanmar about names. Arakan was the name used in British times and until 1988. It is believed to be a corruption of the Portuguese word for Rakhine, and while the state today has the official name Rakhine it is common for foreigners and many locals to use Arakan and Rakhine interchangeably. The old kingdom ruled from Mrauk-U is commonly referred to as the Arakan kingdom. The old kingdom ruled from Mrauk-U is commonly referred to as the Arakan kingdom. That kingdom ended on 31 December 1784 when King Thudhamma was expelled by the forces of the Burma king from Amarapura. Many of the subjects of the Arakanese king fled north across the Naf River as refugees and remnants have struggled ever since to recover what they see as their original Arakanese national identity. The British conquered Arakan and separated it from the Burmese king in 1826. The “Panglong Agreement”, achieved by the national leader General Aung San in 1947 did not include Arakanese or Mon participants, both groups being considered part of “Ministerial Burma” and not separate ethnicities. This set the base for a fresh armed insurrection which has continued with varied intensity to the present day. Nowadays, it takes place in the eastern Rakhine mountains and has contributed armed groups fighting against the central government as far north as the Kachin State. The result today is that there is a three-cornered conflict in Rakhine, but you don’t hear anything about that in the Australian media. Now to the point about the Rohingya themselves. The Rohingya question boils down, in the end, to two points: should they be considered to be a distinct Myanmar national race? And, if so to a degree, or if not, what should be the extent of their inclusion in the polity of the Myanmar nation state? The Rohingya question boils down, in the end, to two points: should they be considered to be a distinct Myanmar national race? And, if so to a degree, or if not, what should be the extent of their inclusion in the polity of the Myanmar nation state? This arises in part because after the British overthrew the King in Mandalay in 1885 and took total control of the upper Burma region and joined it to the already-colonised Lower Burma they absorbed, at the same time, all peripheral “frontier areas”, as they were designated. They were in various types of relationship to the British Crown but technically outside the colonial regime governed from Rangoon/Yangon. Today’s Myanmar has seven “States”, so called because their populations are ethnically distinct from the Burmans in the centre of the country. Their components all had their own relationships to the King in Mandalay, usually as part of what we might describe as a protectorate relationship to the King. The British maintained that relationship with these principalities right up until Burma’s independence was given to the country in January 1948. In the 1891, however, they conducted a census over the Burma which they had colonised, including with the outlying instrumentalities. This was the first census which included those areas, recording a little more than double the number of people counted in the Burma King’s 1881 census. When the British did the census, they divided the country into its ethnicities, and set up a process of examining all localities to create a table of ethnicities which they would then count. The policy was continued by the governments in Burma after independence resulting in today’s 135 registered nationalities making up the country. If we were to do that sort of thing in Australia we would have more than 135 because once you counted all the Aboriginal races and multicultural settlers we would have many more races. But now Burma has its 135, a number which does not include the Rohingya or other unregistered races. When the British did the census, they divided the country into its ethnicities, and set up a process of examining all localities to create a table of ethnicities which they would then count. Describing the people who had coming down from the north of the Naf River and some who lived lower than the Naf as “Chittagonian-Bengalis”, the British decided that most of them had been brought down either for their labour – as semi-slaves or total slaves – or for reasons meant to be short-term but which had become permanent because crops keep growing, roads keep needing to be built and maintained, and so on. This labour population growth continued right up to the time of independence and beyond. As the British saw it, this migrant labour population did not belong in the census. They did however offer the people the opportunity to pay a capitation (poll) poll-tax if they wanted to be counted. As the British saw it, this migrant labour population did not belong in the census. Now, would you pay a tax to be counted in a census? Not too likely. And not many of them did, as you can imagine. However, some did because if they paid the tax and got counted, that then qualified them for equal treatment with the counted – you got ID cards, travel documents, whatever you might need. There was a benefit. But only a minority realized the benefits since most of the indentured were illiterate and failed to understand those opportunities. Another group who did get counted were people whose employers wanted them counted. This could mean a more reliable and better trained of labour force. Thus a number of the “Chittagonian Bengalis”, but a relatively small number, got counted and have had the benefits of citizenship ever since. An unfortunate point, though, is that discrimination and violence based on ethnicity and appearance has consistently restricted their ability to apply for that citizenship. Thus a number of the “Chittagonian Bengalis”, but a relatively small number, got counted and have had the benefits of citizenship ever since. Are they a national race? This is the principal argument now which lies at the base of most of the discussions and the discrimination that we talk about – this question about Rohingya nationality. The concept of national races is rather different from what we would understand by the term in Australia, but in some senses it is akin to our concept of “indigenous” peoples. The government in Myanmar discourages the use of the word Rohingya; doesn’t want it used at all. But there is some sign now that there are people who recognise that the word is here to stay. It’s not an old word in the sense of common usage throughout the country. Many people haven’t seen this word until fairly recently. By that I mean the last 30 years. This word is fairly new. However, it’s a descriptive word. Common Article 1, to the International Covenants on Civil and Political Rights and Economic, Social and Cultural Rights is about the right to self-determination. It’s about the right to an individual to self-determine because it also applies at that level, when you look at the way that human rights work. If somebody wants to say “I am a Rohingya”, I have no problem with that. I might have an issue beyond that in defining what it means in terms of the rights and obligations accorded to that person or group of people, but if people want to call themselves Rohingya, I don’t have a problem. The Myanmar government has built itself a problem because of the way it has reacted to the use of the word. It’s not just Daw Aung San Suu Kyi. It goes back some time and concerns how the word can be used in the context of Myanmar’s legislation. There are people who have told me that before 1982 it was possible to use the term Rohingya, but it was so little known that it made practically no difference to anybody. The Myanmar government has built itself a problem because of the way it has reacted to the use of the word. It’s not just Daw Aung San Suu Kyi. The absence of the name in the documents that people have to use in their official contexts is aligned to their inability to prove that they are accepted as citizens or residents, and are therefore unable to get the ID cards they need for movement around the country, employment and other elements of what we would consider as normal life. If you want to move from place A to place Z at the other side of the country and get a job, you need identity, especially in a country which has heavily bureaucratised system of governance. You need something that proves who you are so you can get yourself a job, you can get yourself a home, you can get your kids to school, you can carry out an ordinary life. Inclusion in Myanmar is very hard to manage when you don’t have a national identity. There is a form that you have to fill out to get your documents and there’s a box in that form where you identify your nationality. A core point for the Rohingya is their wish to identify as this as their nationality. They want to be able to say proudly that this is what they are. There some who can’t do that, including the Chinese, and they generally use the box mentioned above to write their ethnicity, as opposed to nationality. This enables them to proceed to citizenship. Some “Rohingya” have done this too and have obtained citizenship after describing their ethnicity as “Bengali”. A core point for the Rohingya is their wish to identify as this as their nationality. They want to be able to say proudly that this is what they are. But the Rohingya activists say they want to be able to write Rohingya; they want to be proud of being a Myanmar nationality. That’s also the core obstacle to going forward with Kofi Annan’s expectation that the issues will be resolved with the dignity of the people fully respected. This is important. Identification of a Rohingya nationality is the antithesis of a demand for independence. They’re not seeking independence; they want to be part of Myanmar, but with a form of autonomy perhaps similar to those granted to some other populations. To me, if they want to be part of Myanmar: great! Let them be part of it. It’s as we would say to people here in Australia: if you want to be part of Australia, welcome! We want you here. We want you here as part of our system of government; part of our agriculture, our economy, our army, our courts, our local systems. We want your loyalty as citizens and the way you identify your heritage and culture, and religion, is not an obstacle. That’s where I expect we will be able to take the Rohingya argument one day. To me, if they want to be part of Myanmar: great! Let them be part of it. It’s as we would say to people here in Australia: if you want to be part of Australia, welcome! But I want to now go to another piece of context. Mrauk-U was the capital of the kingdom that was put down on the 31 December 1784. East of Mrauk-U are Rakhine Yoma, 1000 km of mountains that separate central Burma from the Rakhine Coast. Insurrection, carried out by the “Arakan Army”, a Buddhist-based armed group which harks back to various disaffections and insurrections since 1784 and the days before the conquest of the Mrauk-U kingdom. 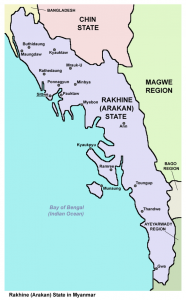 If you look at a map of the Rakhine State, you will see about half way down the coast the port town of Kyaukpyu. Kyaukpyu is central to the economic future of the State, being a good, deep-water port which has been identified by China and as the base on the Bay of Bengal for an oil and gas pipeline which would connect directly to China. It is seen as part of China’s “One Belt, One Road” initiative. At this point you can start to see other interests coming into play. Kyaukpyu is central to the economic future of the State, being a good, deep-water port which has been identified by China and as the base on the Bay of Bengal for an oil and gas pipeline which would connect directly to China. Australia has a significant interest in the way the Myanmar-China relationship goes forward. It is interesting in the Rohingya context that the first gift received by the Myanmar Tatmadaw (the armed forces) after those events in August 2017 was $100,000 from the People’s Liberation Army in China to help the Tatmadaw army provide security in the affected region. It is not too much of a stretch to say that the last thing China (or other investors) want is an insecure Hinterland. Think about that, in the contexts of both the Rohingya conflict and that which concerns the Arakan Army in the mountains. Another country with profound interests in the Rakhine State is India, which has its own questions about the “One Belt, One Road” initiative. Some of those questions are about the initiative in a wide sense but there are others which relate more directly to the way the initiative builds opportunities for China to expand its interests in Myanmar. India has many historical interests dating back to before British colonisation, but geography plays an important part. Geography, and transport initiatives supporting the aspirations of China and India is a reason for Australia to pay particular interest to what both countries may be intending to do. Both countries are promoting road and other links from their countries through Myanmar to other destinations. The roads into Myanmar from both countries both envisage Mandalay as the natural hub, and also the link to the Bay of Bengal at Kyaukpyu. Geography, and transport initiatives supporting the aspirations of China and India is a reason for Australia to pay particular interest to what both countries may be intending to do. I’ve spent some minutes on this geography because it helps explain why so much effort is put into the Rakhine/Rohingya situation. It would take too long in this presentation to do examine closely the security situation in the State, but for today’s purposes it’s necessary to note that the Myanmar Government is aware of the importance to impose security in the north bordering Bangladesh and in the mountains through which the routes to Mandalay run. Much of the current discussion is about events which have taken place since August 2017. There is too little attention being given to the search for solutions and compromises which could provide security through people-centred actions. The events surrounding the population which has fled to Bangladesh bring back eternal questions – does security depend on peace, or is peace the precondition for security? The events surrounding the population which has fled to Bangladesh bring back eternal questions – does security depend on peace, or is peace the precondition for security? Most of the people, however, haven’t got any documents, for various reasons including destruction or loss. Myanmar has now agreed to accept, as something akin to documentary evidence, evidence such as statements from a village leader to say the returnee had been recognised as one of them. Processing that with a million people will take a long time. I saw a report the other day that 63 people had returned voluntarily. That’s not many out of a million and in any case it was not part of the formal agreement with Bangladesh. Former UN Secretary General Kofi Annan headed a Myanmar-appointed Advisory Commission into the issues, which presented its final report with recommendations August 2017. The report was welcomed by everybody – by the international community, the UN, the human rights NGOs, the government of Myanmar, the government of Bangladesh. It is however important that extremists in Myanmar said the report was a sell out to the international community; extremists on the Rohingya side said that the recommendations didn’t meet their central demands. A difficulty with assessing these extremist demands is that neither side has what might be seen as an organisational structure which can be seen as having the capacity to speak for those it claims to represent. It still isn’t clear exactly what those demands are. A difficulty with assessing these extremist demands is that neither side has what might be seen as an organisational structure which can be seen as having the capacity to speak for those it claims to represent. The Annan Report recommendations are very important. There are 88 in all, cover everything. There are economic chapters, a citizenship chapter and much more. It is a report about the Rakhine State, not specifically about the Rohingya but everyone knows that the reason for the task was the Rohingya, including matters relating to their Muslim faith. Some of the recommendations include specific reference to Muslims. There are matters of verification processes without an ethnicity requirement. As I said, there is not an ethnicity requirement now, but if you leave that box on the form blank and don’t write anything there you may encounter a township officer insisting that you write something there. Remember too that many of the affected people are unlikely to understand the complexities of any forms, let alone forms as important as this. This shows why civil servants will need a lot more education about how to implement the transition if the Annan Report is to be implemented successfully. This will include attention to helping the population understand their rights – rights which many of them will never have known exist. Given the state of literacy of that population – and Rakhine has a low literacy level in Myanmar, not the lowest but relatively low – it’s hard to see how this can go forward without significant human and material resource assistance. Everyone agrees that the returns from Bangladesh will be voluntary, safe and – a key word – dignified. Dignity includes an understanding on all sides that the people must be able to be stakeholders in their own future, not just as pawns that get shuffled around the chessboard while the kings and bishops play elsewhere. UN and NGO humanitarian staff – national and international – have to be part of that and need to be able to go unimpeded about their humanitarian work there. This work needs to be much more than material assistance, for dignity is a priority forever, well beyond the provision of emergency assistance. To help ensure that dignity is delivered, both domestic and international media will need full and unimpeded access. All these requirements are in the Annan Report and have been accepted, but they are not yet in place. Everyone agrees that the returns from Bangladesh will be voluntary, safe and – a key word – dignified. Dignity includes an understanding on all sides that the people must be able to be stakeholders in their own future. In my view, Australia’s job is to put its full weight behind getting the Annan Report recommendations implemented, working from the standpoint that the Myanmar Government has accepted them. This support should take many forms. I won’t detail more than a few, but there needs to be assistance in addressing corruption; local implementation should be done with local stakeholders, also involving women and youth; civil society organisations should have easier registration opportunities; and more. There also needs to be attention to claims that narcotics trafficking across the border is properly addressed – some reports suggest that the involvement of organised crime in border affairs is a real concern. There also needs to be attention to claims that narcotics trafficking across the border is properly addressed – some reports suggest that the involvement of organised crime in border affairs is a real concern. The Annan Report identified hate speech as a major contributor to the violence of 2016 (and by extension the violence which took place after his report was presented to the government in August 2017). This is very important, especially as extremists on both sides have taken advantage of social media as the most effective distributor hate to the countries populations. The sim card phenomenon in Myanmar is a case example of value. To have a sim card there five years ago cost you something of the equivalent of $A3000. In 2013, President Thein Sein, the predecessor of the present government, cut the price of a sim card from that figure to $1.50. This lead to a huge rush on sim cards and they didn’t have enough to go around. After responding to loud public demands the situation now is that about 103 per cent of the Myanmar population has a sim card. Those are the numbers. Of course, many people have several sim cards. I’ve got two, myself, because different networks work better in some areas than others. Nevertheless, if you discount the babies and the very elderly you’d probably still find that around 95 per cent of the population has access to a sim card. In 2013, President Thein Sein, the predecessor of the present government, cut the price of a sim card from that figure to $1.50. This lead to a huge rush on sim cards and they didn’t have enough to go around. Mobile phones imported from neighboring China cost very little in the markets and the result has been that there is very wide access to the internet and an explosion in the use of Facebook. There are 18 million people registered on Facebook in Myanmar at the moment and they use it in Burmese script. Many people in Myanmar speak of Facebook as the internet. After Facebook scandals hit the international news in early 2017, six human rights NGOs in Myanmar, who operate with considerable freedom, wrote to Mark Zuckerberg and told him he had let the country down very badly. Facebook had facilitated all sorts of hate-speech and, in fact, had contributed significantly to the terrible situation Myanmar now faced with rights being violated by people everywhere. And it’s true. There are a lot of operations running in the country from extremist sides on both ends of this debate, trying to inflame their own base. Similar stories exist concerning other social media, but Facebook is very strong and is being used widely, including by the government, the Tatmadaw and other institutional entities. Facebook had facilitated all sorts of hate-speech and, in fact, had contributed significantly to the terrible situation Myanmar now faced with rights being violated by people everywhere. Zuckerberg admitted that, for this population of 18 million Facebook users in Burmese, there was (in early 2017) only one moderator capable of handling the language. He promised to build the number up as fast as he could. About a month and a half later he reported they had now increased the number from one to 12. There are now at 80 moderators for 18 million people. You can’t possibly control hate-speech if you don’t do something serious about the mechanisms which distribute the hate speech as soon as you see it. As I’ve said, this was identified by the Annan Commission long before Mark Zuckerberg was confronted with it. If Myanmar, with the help of countries like Australia, is to help address the Rohingya crisis we should work to deal with hate speech as a principal precursor to the rebuilding of respect and dignity. Kofi Annan’s second last recommendation involved a ministerial level appointment to implement much of the recommendations. Daw Aung San Suu Kyi agreed to that and immediately appointed as the head of the implementation committee Minister U Win Myat Aye who is the Minister for Social Welfare, Relief and Resettlement. He’s a pediatrician. He’s a good man and is quite well known in Australia. But his function is difficult to define. Myanmar’s constitution was adopted only in 2008, at the time of a military government which still is running the country. Under the constitution, the Ministries of Defence, Home Affairs (police and immigration among other things) and Border Affairs (therefore including the area along the Naf River) are reserved to the army. The ministers are appointed by the Commander-in-Chief. The extent of their acceptance of oversight from U Win Myat Aye has yet to be measured but without a clear role for him, known and understood by the international community, it will be difficult for observers to attach credibility or value to the implementation of the Annan recommendations. Myanmar’s constitution was adopted only in 2008, at the time of a military government which still is running the country. My belief is that Minister Win Myat Aye needs full support to ensure that his work assures the returning population that civilians be in charge of the restoration of dignity. By my most recent count in mid 2018, and it might be wrong by now, Australia has given $41.5 million to support the people around the Cox’s Bazar area. That’s very good, but it’s band-aids to meet emergency needs. It’s important, for sure, but Australia as a regional country has to look further ahead. In my view Australia should prioritise work for a dignified future in Myanmar for people returning voluntarily from the camps around Cox’s Bazar. Our role is not the same as that assumed by generous providers of humanitarian assistance in Europe and elsewhere – we have strategic interests in play in Myanmar in general and the Rakhine State in particular, and this is what should guide Australia’s policy approach. In my view Australia should prioritise work for a dignified future in Myanmar for people returning voluntarily from the camps around Cox’s Bazar. I don’t pretend that this would be easy, but it is a subject which members of the Australia Myanmar Institute are studying with care. We have many contacts on all sides of the issue in Myanmar, and with DFAT, and look forward to helping where we can in the future.